TEMPLE SOLAR WATER FOUNTAIN by Cascading Fountains home decor, jewelry, decor, decorations, electronics, fountains, floor mats, art glass, vases, garden essentials, fireplace screens. Graceful Asian fountain has the authentic look of hand-hewn stone; a dramatic addition to your outdoor dcor! 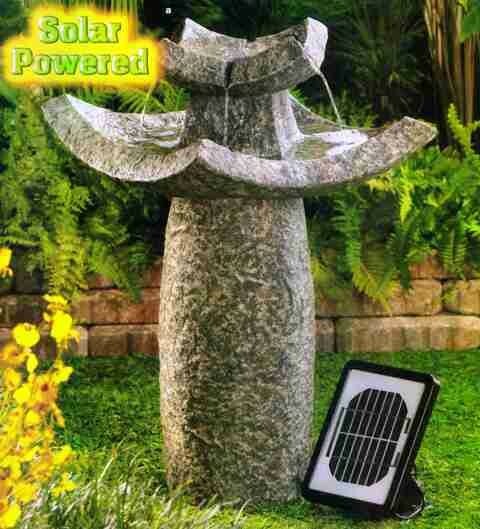 Place this dual powered fountain anywhere you please: Solar panels for cord-free enjoyment, or an electrical plug for shady locations or overcast days. Ingenious! Electrical water pump included. Material(s): POLYRESIN SAND STONE POWDER. Weight 16.5 pounds. Dimensions 15.3" x 15.3" x 24.9".